﻿ Why are scarcity and choice basic problems of economics? What is scarcity? Give different definitions. Why must people make choices? 5. What do economists mean when they use the term ‘opportunity cost’? In what way is opportunity cost expressed? Are these statements True or False? Prove your decision. Human needs and wants can’t be satisfied. Scarcity exists because society can produce limited amounts of goods and services with insufficient resources. Scarcity forces us to forgo some alternatives. Economics is sometimes called the study of choice. 5. ‘Opportunity cost’ is what the decision-maker must forgo in order to make the choice that is finally made. Opportunity cost is the fundamental economic problem. Reproduce the context in which the following word-combinations are used. 1. Complete the gaps using the vocabulary. … (1) are important because they are used to make goods, like television, cars and houses and to provide …(2), like banking, insurance and transport. All of these resources are …(3). Any resources that are not scarce are called …(4). Wants are …(5) but the resources used to produce the goods and services to satisfy these wants are …(6). So, there exists …(7). …(8) is necessary because scarce resources can be used in lots of ways to make different goods and services. The real cost of choosing one thing and not another is known as the …(9). 2. Choose the right word to complete the sentences. 1. Hunger ... in many parts of the world. 2. We have to … the results of our experiment. 3. We want to build a house. Last year we bought some … in the village. 4. The company offers its employees a pension plan, free health insurance, and other … . 5. The wants we seek to … are limited. 3. Give the English equivalents to the following. 1. Explain the fact that people exchange goods and services because they expect to be better off (материально жить лучше) after the exchange. 2. Explain that whenever a choice is made, something is given up. 3. Discuss the following question with your groupmates. Give your arguments for or against. Do you agree that the problem of scarcity is faced by rich and poor societies? 1. What is the main idea of the text about scarcity and choice? Is it only to explain what scarcity and choice are? 2. Divide the text into parts and make up a plan. What are these parts about? 3. Find in the text the most important details that may be added to support the main points. Use the following vocabulary. 2. Do you know how the law of demand and supply works? 1. Mind the pronunciation of the following words. Learn this vocabulary. Use one of the words from Task 1 to complete the sentences. Mind grammar forms. 1. Our company provided … employment opportunities. 2. We divided the profits into three … shares. 3. Unfortunately, sales … by five percent this year. 4. They will soon … the price from $50 to $60. 5. These changes will … our expenses. 6. His salary … mine. A market is defined as a group of buyers and sellers of a particular product or service. Competitive markets are markets with many buyers and sellers, so that each has a very small influence on the price. Supply and demand is the most useful model for a competitive market, and shows how buyers (citizens) and sellers (businesses) interact in that market. The first thing to understand is that demand is not the same as desire, or need, or want. When desire is supported by the ability and willingness to pay the price, it becomes an effective demand and has an influence in the market. Demand, in economics, may be defined as “the quantity of the commodity which will be demanded at any given price over some given period of time”. According to the law of demand, price has a significant effect on demand. Consumers will buy less at higher prices and more at lower prices. Supply is not the same thing as “amount available”. We are only concerned here with the amounts actually brought to market and these amounts depend on the ruling market price. The basic law of supply says “More will be supplied at a higher price than at a lower price”. An increase in price usually means that production will become more profitable. In addition, an increase in price would tend to encourage new firms to enter the industry. It is possible for supply and demand to be equal. In this case, the amount of supplied products or services must equal the demand for those products and services. If this relationship between supply and demand is attained, the economy is balanced in a state of equilibrium. If supply continues to increase and demand softens (or even remains constant), prices will continue to fall. 1. What is a market? What is a competitive market? 2. What does “supply and demand” model show? 3. When does desire become an effective demand? 4. Do prices have any effect on demand? Why? 5. What factors influence consumers to buy more or less of a product? 6. What do the basic laws of demand and supply say? 7. What influences the amount of a good or service supplied to the market? 8. Is it possible for supply and demand to be equal? In what case? 2. Complete the following statements. 1. Buyers and sellers in a competitive market … . 2. … is not the same as desire. 3. “The quantity of the commodity which will be demanded at any given price over some given period of time” is … . 4. According to the law of demand, consumers … . 5. Production will become more profitable if … . 6. A state of equilibrium is … . 3. Do you agree with the following statements? Use the given vocabulary to explain your choice. 1. Supply and demand is a model for a competitive market, which shows how buyers and sellers influence prices. 2. Demand is the ability and willingness to pay the price. 3. According to the law of demand, price has a great influence on demand. 4. More goods will be supplied at a higher price than at a lower price. 5. If supply and demand are equal, the economy is balanced in a state of equilibrium. 2. Look through the text and find the equivalents or synonyms of the following words. 3. Use the vocabulary of the text to complete the sentences. Guess the suitable word by the first letter. 1. You need a degree to be c… in today's job market. 2. I completely s… your decision to buy new equipment. 3. He thinks that the new regulations will e… people to invest. 4. The car can a… a top speed of 200 km/h. 5. These two chemicals i… with each other at a certain temperature. 6. The boss is worried about q… as well as quality. A. Works that are performed for someone. B. Basic requirements for survival. C. Location or other mechanism that allows buyers to exchange economic products. D. Means of expressing needs. 2. Suppose that there has been a decline in the price of pork (свинина). What effect will this have on the market for beef (говядина)? 3. Which of the following provides an example of complementary goods? Think of your own examples of complementary goods. 1. Identify the main idea of the text “Demand and Supply”. 2. Divide the text into logically completed parts and make up a plan of this text. Express your opinion on the following issues. 1. Is scarcity an economic or social issue? 2. Is it possible to solve the problem of scarcity? Why? Study the following list of vocabulary. Match the words on the left with those on the right. Then translate the expressions into Russian. Read the following text and be ready to explain what “opportunity cost” means. Economists are concerned with how we make choices in a world of scarce resources. Individuals, families, business firms and governments must make decisions about how best to allocate limited resources. But when resources are limited, choices are limited as well. This means that the decision to have one thing is, at the same time, the decision not to have something else. Suppose, for example, that the government chose to pay for the increase in the size of its air force with the money it had saved by building fewer schools. In that case the increase in defense was paid for by a reduction in the number of schools. So, the opportunity cost of any decision is the value of the next best alternative that is given up. The concept of opportunity cost was first developed by John Stuart Mill. It is a key concept in economics. It has been described as expressing the basic relationship between scarcity and choice. The notion of opportunity cost plays an important role in ensuring that scarce resources are used efficiently. It is important to understand that opportunity costs are not restricted to financial costs, but lost time, pleasure or any other benefit that provides utility should also be considered as opportunity costs. Assessing opportunity costs is fundamental to assessing the true cost of any course of action. However, opportunity cost is not the sum of the available alternatives when those alternatives are mutually exclusive to each other. The opportunity cost of the city’s decision to build the hospital on its vacant land is the loss of the land for a sports center, or the inability to use the land for a parking lot, or the money which could have been earned from selling the land, as using any one of those purposes would prevent the possibility to implement any other. It is also the cost of the forgone products after making a choice. In the science of economics the concept of opportunity cost has a wide range of applications, including a consumer choice, production possibilities, cost of capital, time management and a career choice. 1. Agree or disagree with these statements about the text. 1. When resources are limited, our choices are not limited. 2. The opportunity cost of any decision is the value of the next best alternative that is given up. 3. The concept of opportunity cost is a key concept in economics. 4. The concept of opportunity cost was first developed by Alfred Marshall. 5. Assessing opportunity costs is fundamental to assessing the true cost of any course of action. 2. Complete the sentences using the information from the text. 3. Choose the sentence which best explains the role of opportunity cost in economics. A. In the science of economics the concept of opportunity cost has a wide range of applications. B. The concept of opportunity cost is a key concept in economics and it plays an important role in ensuring that scarce resources are used efficiently. C. The decision to have one thing is, at the same time, the decision not to have something else. 1. Match the words on the left with their synonyms on the right. 2. Use the words from the list of Useful Vocabulary to complete the sentences. 1. Those who make financial contributions to firms for the ..... of earning profit are known as investors. 2. Good managerial work is of great ….. for obtaining high profits. 3. In a free market economy producers try to ….. all consumers’ tastes. 4. Opportunity ….. are to be calculated for labor and financial capital used in production. 5. The purpose of governmental regulations is to allocate ….. resources rationally. 3. Give the English equivalents to the following expressions. 1. Try to explain the term “opportunity cost” in your own words. 2. Discuss the following issues in small groups and then report your findings. a. What is the opportunity cost involved in a decision to continue education after finishing school? b. What was the opportunity cost of your latest major purchase? 1. Revise the list of basic steps in summarizing. 1. Skim the original text and identify its main idea. 2. Divide the text into logically completed parts. 3. Read the text again and draw up an outline of the text. 4. Give a one-sentence summary of each item of the outline in your own words. 5. Find in the original text the most important details that may be added to support the main points. 6. Use appropriate words and phrases to show the logical connection between the parts of the summary. 2. Divide the phrases for summarizing into 3 groups and fill in the table. 3. Summarize the text from Reading. Use phrases for your summary from Task 2. 1. Do you agree with those who say that time is money? Give your arguments. 2. In your opinion, what’s the best way of making a lot of money? 3. In our everyday lives we often refer to “money” as one of three things: coins and paper money (currency); a person’s wealth; a person’s income. Using this vocabulary and working with a partner, try to define the term ‘money’. 1. Study the following vocabulary. · moneyis used only in the singular (в единственном числе), e.g. Where is my money? This money is mine.Money makes money. 1. In your “Key Vocabulary”, find synonyms and antonyms to the words below. Use a dictionary and learn this vocabulary. Read the text and get ready to define all the types and functions of money. Money is any good that is widely used and accepted in transactions involving the transfer of goods and services from one person to another. Economists differentiate between three different types of money: commodity money, fiat money,andbank money. Commodity money is a good whose value serves as the value of money. Gold coins are an example of commodity money. Fiat money is money that has value only because of the government regulation or law. Dollar bills are an example of fiat money. Bank money is the balance held in checking accounts and savings accounts. Bank deposits usually form the larger part of the money supply of a country. Some people may think that money's function is limited to one use — to buy things. Money actually has three functions, which allow money to be exchangeable, durable, and valuable. Classically it is said that money acts as a medium of exchange, a unit of account, and a store of value. The most important function of money is as a medium of exchange to facilitate transactions. Without money, all transactions would have to be conducted by barter, which involves direct exchange of one good or service for another. The difficulty with a barter system is that in order to obtain a particular good or service, a person has to possess a good or service of equal value, which the supplier also desires. In order to be a medium of exchange, money must hold its value over time; that is, it must be a store of value. But as a store of value, money is not unique; many other stores of value exist, such as land, works of art, stamps. Money also functions as a unit of account, providing a common measure of the value of goods and services being exchanged. Knowing the value or price of a good, in terms of money, enables both the supplier and the purchaser of the good to make decisions about how much of the good to supply and how much of the good to purchase. Today money is considered one of the outstanding inventions of the entire history of mankind. The introduction of money has eliminated all the difficulties of a barter system, it has made easy to save wealth for future, and has played a significant role for the specialization in business through the division of labour. Although money itself creates nothing, it is very helpful in the process of production, consumption and exchange. 1. Economists differentiate between three different types of money:commodity money,a store of value, a unit of account. 2. 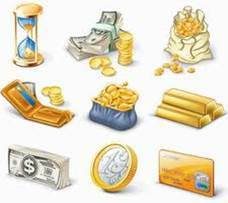 Commodity money is a medium of exchange that may be transformed into a good, useful in production or consumption. 3. Bank money is money that has value only because of the government regulation. 4. The function of money is limited to one use — to buy things. 5. Barter involves direct exchange of one good or service for another. 6. The most important function of money is a store of value. 7. There are many different stores of value. 8. Knowing the value or price of a good enables suppliers and purchasers to make different decisions. 2. Read the text more carefully and complete the following statements. In some cases more than variant is possible. 1. Money is … . 2. Commodity, fiat and bank money are … . 3. Bank money is … . 4. Money can be … . 5. Without money … . 6. … in order to be a medium of exchange. 7. As a unit of account, money … . 8. The introduction of money … . 3. Prepare to speak about money. Firstly, complete the following plan of the text. b. Money as a store of value. e) to … means ‘to make easier or less difficult’. 2. Complete the sentences with the words from the box. Mind grammar forms. 1. Careful planning … any kind of work. 2. The company plans to … more than 2,000 jobs in the coming year. 3. The machines have to be made of … materials. 4. … is a standard monetary unit of measurement of value of goods, services, or assets. 5. Something commonly accepted in exchange for goods and services and recognized as representing a standard of value is … . 6. This painting is extremely … . 3. Match the verbs on the left with nouns on the right to make phrases from the text. Translate them and use in the sentences of your own. 1. Think and say whether you agree or disagree with the following quotations and proverbs. Be ready to express your opinion and give their Russian equivalents. a) A penny saved is a penny earned. b) Lend your money and lose your friend. d) Never spend your money before you have it. 2. Plastic money has become the alternative to cash or standard money nowadays. In small groups brainstorm the questions: Are credit cards a form of money? If not, why do we call them ‘plastic money’? What are their advantages and disadvantages? 3. What do you know about WebMoney? How can people use it and why is it convenient? 1. Read the passage. What title can you suggest? Most of the money used by business comes from the sale of its products and services. Since these funds come from within the firm they are described as internal funds. The rest must come from outside, or external funds. 3. What have you learned from this passage? Use the given expressions. 1. Express your opinion on the following issues. 1. How would you define the term “market” in your own words? 2. What factors influence prices in the market? - If I were a marketer, I would ……… . 1. Study the meanings of the following concepts. 1. perfect competition – чистая конкуренция: рыночная структура, при которой большое число фирм предлагает однородный продукт и ни одна фирма не имеет достаточно большой доли рынка; в результате производитель не имеет контроля над ценой, по которой продаётся продукция и может манипулировать только объёмом своего выпуска. 2. monopolistic competition – монополистическая конкуренция: рыночная структура, относящаяся к несовершенной конкуренции, при которой фирмы конкурируют, но при этом имеют черты монополий, поскольку производят дифференцированный продукт. 3. monopoly – монополия: рыночная структура, характеризующаяся наличием на рынке какого-либо блага единственного продавца и большого количества покупателей, отсутствием совершенных заменителей продукции продавца, отсутствием свободы входа на рынок; в силу этих характеристик продавец обладает абсолютной властью над рыночной ценой. 4. oligopoly – олигополия: рыночная структура, характеризующаяся существованием на рынке незначительного числа продавцов при наличии большого числа покупателей. 2. Translate the sentences into Russian. Mind the words from exercise 1. 1. Monopoly is known as a situation in which one seller controls the total supply. 2. Each oligopolistic firm keeps a close eye on the activities of other firms in the industry. 3. The retail gas market is a good example of an oligopoly, because a small number of firms control a large market share. 4. The real world is widely populated by monopolistic competition. 5. The best examples of monopolistic competition come from retail trade, including restaurants, clothing stores, and convenience stores. 6. Perfect competition is an idealized market structure which achieves an efficient allocation of resources. Read the text and answer the questions that follow it. The study of markets and other ways of organizing production of goods and services is an important task of economics. In ancient times a market was a place where people gathered to buy and sell goods. Nowadays the term «market» has a broader sense. According to its definition, market is a set of arrangements by which buyers and sellers are in contact to exchange goods and services. It is considered to be the institution through which buyers and sellers interact. The interaction may be different. For example, street markets, fruit stalls and shops physically bring together buyers and sellers. At the same time, suppliers and customers can interact through more complex markets. The Stock Exchange is known to operate through intermediaries (stockbrokers) who transact business on behalf of their clients. At the century of IT boom people can make exchanges on the phone. They are in the market even if they don’t actually visit a store. Similarly, people can order goods and services by mail or on the Internet, where it is possible to make deals all over the world. And again they are in the market because they make a voluntary exchange, when both parties benefit. As for their scope, markets can be local, national and international. Economists classify markets according to prevailing conditions and try to determine a market structure. There are specific names for different market structures. They are pure competition, monopolistic competition, monopoly and oligopoly. The preferences of sellers and buyers are determined by the supply and demand in various markets and the outcome of these preferences is a system of prices. A price is the main index which sellers, entrepreneurs and consumers take into account while making their free choice according to their self-interests. In economics, the term “price” denotes consideration in cash for the transfer of something valuable, such as goods, services, currencies, securities, etc. Prices perform two important functions: they ration scarce resources and motivate production. As a rule, the more scarce something is, the higher its price will be and the fewer people will want to buy it. Prices play an important role in different markets. If there were no price system, it would be impossible to determine value of any goods or services. For example, in a market economy prices act as signals. Buyers and sellers use prices as signals to communicate their wants and then exchange money for goods and services. So, a high price is a signal for sellers to produce more and for consumers to buy less. A low price is a signal for sellers to produce less and for consumers to buy more. That is why prices serve as a link between producers and consumers. Moreover, in a market economy the price system is flexible and it can adjust to changes quite quickly. 1. What was the role of market in ancient times? 2. What definition of the term “market” is given in the text? 3. According to their scope, how are markets classified? 4. What examples of market structures are given in the text? 5. What does the term “price” mean? 6. What are the basic functions of prices? 7. What do prices mean as signals? 2. Choose the paragraph, where different kinds of interaction between buyers and sellers are described. 3. Choose the sentence which best summarizes the last paragraph of the text. A. In a market economy the price system is flexible. B. A low price is a signal for sellers to produce less and for consumers to buy more. C. Prices play an important role in different markets. 1. Match the words with their definitions. 1. Price elasticity is only one of the problems studied by economists in the theory of demand and ….. .
2. The marketing concept says that marketing managers should meet the needs of ….. .
3. The ….. of some goods doesn’t vary greatly within a particular market as all sellers impose practically the same prices. 4. ….. often leads to lower prices and the introduction of differentiated products. 5. Some experts say a ….. is a person who can create out of nothing a viable business. 1. Give your arguments to support the following statements. A. Marketing helps people satisfy their needs and wants. B. Prices serve as a link between producers and consumers. 2. Express your opinion on the following points. 1. If you had such a chance, what goods and services would you promote in the Belarusian market? Explain your choice, using the following expressions. 2. Prove or disprove that price stability (i.e. keeping inflation low) is more important than other economic aims, such as attempting to reduce unemployment. 1. Look through the text from Reading once more and divide it into 6 logical parts. 2. Fill in the missing points in the plan of the text. VI. The role of prices in different markets. 3. Use the plan of the text to summarize its contents. 1. Of the three factors of production in classical economics – land, labour, and capital – land may be the most difficult to define. In your opinion, does it refer just to the land itself? 2. Do you agree that understanding the factor of entrepreneurship is an important part of understanding the dynamics of the market economy? Why? Study the following vocabulary and do the task that follows. 1. Use key vocabulary to complete the sentences. 1. Macroeconomics studies the total output of a nation and the way the nation allocates its limited … of land, labor and capital. 2. A customer's … are usually safety, quality, and value. 3. If you … ownership of your business with someone else, your business will not be a sole proprietorship. 4. Inform me where the conference will … . 5. Management skills can be a separate factor of production called … . 6. My secretary … in making the decision. Read the text and find out what factors of production are. Economists have long recognized the three major factors that people use to create the things they want. 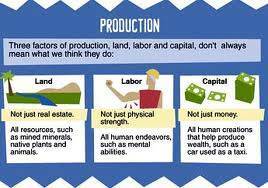 Land, labor, and capital are "factors of production”, or “inputs”. Each factor plays an important role in the production of goods, and each factor is clearly distinguishable from the other two. Land includes not only the site of production but natural resources above or below the soil. These are agricultural land, mineral deposits, forest, rivers, lakes, oil deposits, mountains, etc. Land is a passive factor in production. To make the gifts of nature satisfy our needs and desires, human beings must do something with natural resources. This activity is called labour. Thus, labour is human effort – physical and mental – which is directed to the production of goods and services. But labour is not only a factor of production, it is also the reason why economic activity takes place. The people who take part in production are also consumers, the sum of whose individual demands provides a business person with the incentive to undertake action. Capital is a man-made resource. Any product of labour and land which is reserved for use in the further production is capital. Capital was created when people began to make simple tools to assist them in the production of food, the hunting of animals, and in the transportation of their possessions. Entrepreneurship is also sometimes considered a factor of production. Land, labour, and capital will not produce anything. There must be some person or persons who will organize these three factors so that production takes place. Someone must take the decisions what, how, and where to produce. Whoever takes the decisions and the risks is known as an entrepreneur. Organisation, management and risk-bearing – these are the entrepreneurial functions. In a one-person business, they are all carried out by the sole-proprietor. In a large company, the functions are shared. 1. Use the best alternative to complete the statements. c) production of goods and services. c) directed to the production of goods and services. c) the practice of starting a new business. 2. Are these statements True or False? Correct the false ones. 1. There are three factors of production. 2. Land is a man-made resource. 3. Labour can be both physical and mental. 4. Labour is a passive factor in production. 5. The entrepreneur must take the decisions what, how, and where to produce. 2. Does land include only the site of production? 3. Why is land considered a passive factor of production? 4. Is labour only a factor of production? 5. How do capital and labor differ from land? 6. Who takes decisions and risks in the process of production? 7. What are the entrepreneurial functions? 1. With the help of the text, translate into English the following words and phrases. 2. Find in the text synonyms to the words below. 3. Fill in the gaps with prepositions, if necessary. 1. My colleagues are carrying … research on business ethics. 2. We shared … the money equally. 3. The meeting takes place … the hall every Friday. 4. The President was assisted … his advisers. 5. I sometimes have difficulty distinguishing Spanish … Portuguese. 1. Explain why the factors of production are interdependent. 2. Consider the four factors of production that went into the making of any book. Label each item: LD for land, LR for labor, C for capital, or E for entrepreneurship. 2. “An Entrepreneur”, according to the American Heritage Dictionary, is “someone who organizes, operates, and assumes risk for business ventures.” In your opinion, what some common traits of character do successful entrepreneurs share? 3. Is it possible to improve the efficiency of the factors of production? If yes, in what way? 1. Read the text about factors of production once again. What is its main idea? 2. Divide the text into logically complete parts. Take notes on the most important information each paragraph contains. Report it to the whole group. 1. Many people dream of having their own business. To see if starting a business is right for you, you have to ask yourself some very important questions. Your answers will help you determine if you are ready to become a small business owner, what kind of business you want, what your target audience is, who your competitors are, etc. Working with a partner, make a list of these questions. 2. Would you like to start your own business? What kind of business would it be? What would your main business goal be? Make sure you know the following words and word-combinations.